I know, I know…it’s a weird time to be posting. Since I didn’t get to post this morning (thanks to Blogger having major issues), I thought I’d add one more very quick post tonight. After sharing the different options I found for floral fabrics, I think the majority of you said I should go with the Alexander Henry fabric with the birds on it. The more I looked at it, the more I agreed. It was definitely more “me” than any of the other fabrics—bright, colorful, whimsical, with birds! Yeah! 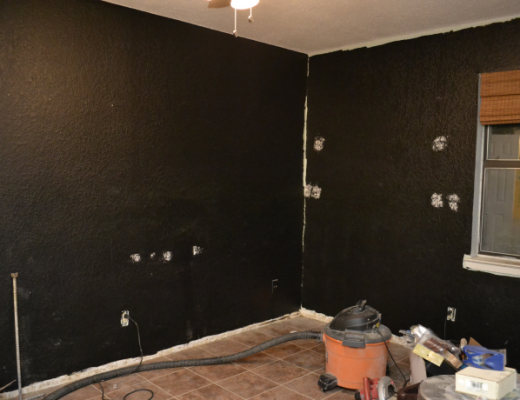 The walls may be black, but there’s no way that’s going to be a dark and depressing room, and I right?! Now that I have a vision for the colors and patterns, I just have to decide how I’m going to use all of them. That’s the hard part. I love those colors and can't wait. I love black or navy, navy blue rooms – it will be fantastic! GREAT choices…. can't wait to see how you use all those wonderful fabrics…. Megan, my little condo gets very little natural light as well, so we'll see how it turns out. 🙂 Hopefully I can pull it off, but I'm also not as adverse to dark rooms as most people seem to be. Awesome fabric choices! Can't wait to see the finished room!